People on Fox News and Teapartiers on Twitter need to stop referring to the Affordable Care Act as "A Bill". It's "A Law" and it has been since it was passed by the 111th Congress and signed by the President in 2010. I'm generally a pacifist, but the 2013 Annual Liberal War On Christmas is officially started! If Kmart can start running Christmas ads in early September, we're going to have to get our Annual Liberal War On Christmas (ALWOC) revved up earlier this year. On Language and Twitter and Peace and War. I have aesthetic preferences when it comes to Twitter. I like a tweet that uses complete sentences, no abbreviations, proper punctuation, and exactly 140 characters. When the first draft of one of my tweets meets all these criteria, I feel as if it has automatically assumed a level of truthiness, as if the muses had written it, not me. Well, here's the tweet I woke up with this morning. It meets all my aesthetic criteria. The last period of my first draft was character number 140. We're living one of the most important moments in the long debate over how democracies should wage war. The 'No' of the people needs to win. Anyone else getting the feeling that Pres Obama went to Congress to get a No vote on unilateral action? Leaves him free to pursue diplomacy. I believe that the candidate and constitutional law professor from Illinois believed (and believes) what he said on December 20, 2007: "The President does not have power under the Constitution to unilaterally authorize a military attack in a situation that does not involve stopping an actual or imminent threat to the nation." Going to Congress before attacking Syria and having Congress assert its war powers by voting no is that candidate living up to his word, and his Congressional "loss" could be his ultimate objective. The Senator and candidate Obama did not want any President to have the war powers he (and his successors) currently hold. Handing some of that power back to the people and their representatives could turn out to be one of his most important achievements. As we get further and further in time from the Presidency of Lyndon Baines Johnson, the parts of his legacy that stand out seem more and more impressive: Medicare, Medicaid, the Voting Rights Acts of 1964, 1965, & 1968, the Public Broadcasting Act of 1967, the Department of Transportation, Head Start, the Higher Education Act of 1965, Bilingual Education Act of 1968, the Motor Vehicle Safety Act of 1968 inspired by Ralph Nader, the Endangered Species Act of 1966, the National Endowment for the Arts, the National Endowment for the Humanities, and more. The list of programs falling under the umbrella of The Great Society read like a Teapublican's wish list of the main elements of America's 20th-Century liberal legacy that they are working so hard to roll back. But I remember 1968, and Lyndon Baines Johnson for me was a symbol of everything that was old and illiberal and out of touch, bordering on evil. It was because of one issue that overshadowed EVERYTHING that he did on the domestic front: Vietnam. LBJ didn't start the war and he had wide bipartisan support for the Gulf of Tonkin Resolution in 1964 (416-0 in the House and only Morse and Gruening voting no in the Senate) that gave the green light for his escalations (think "Surges" in 21st-Century Newspeak), but it didn't take long for that police action in Southeast Asia to tear the country, and the Democratic Party, in half. There are major differences between LBJ and BHO, beyond the fact that the Obama's Affordable Health Care Act doesn't hold a candle to the domestic achievments of Johnson. First of all, the wars of Afghanistan and Iraq will always be Bush's wars and the crimes of waterboarding and Abu Ghraib will always belong to the previous regime. But the biggest change between the war of my youth and these endless wars of the 21st century is the lack of a draft. If the privileged children of the suburbs planning on peaceful futures saw those futures usurped by their birthday drawing a low number in a draft lottery, then there would have been millions of young people in the street against these endless wars no matter who was living in the White House. There are some rumblings of direct action against the current corporate-controlled power structure which supports the current wars and leans from center-right Democrats to lunatic Teapublican fringe, but "Occupy Wall Street" is never going to motivate millions to hit the streets the way the Moratoriums and other mass marches against the Vietnam War. He has almost closed down the illegal war on Iraq, but with Barack Obama's failure to close Guantanamo Bay, his willingness to impose the death penalty by remote control on American cititzens this week, his surge in Afghanistan, and his acceptance of the Patriot Act and other assumptions of the so-called "War on Terror", it may not be too long before responsibility for these awful foreign policies starts sticking to his administration. And until the military stops draining our national treasure, he won't have the resources to accomplish even one hundredth of what LBJ did domestically during his brief time in the White House. Can We Permanently Ban "Boots On The Ground"? 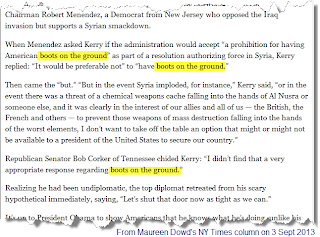 I think it's been a while since I've gone off on a language rant here, but is everyone else (other than the usual suspects within The Beltway and The Media) as sick to death of this never-ending use of "boots on the ground" as I am? 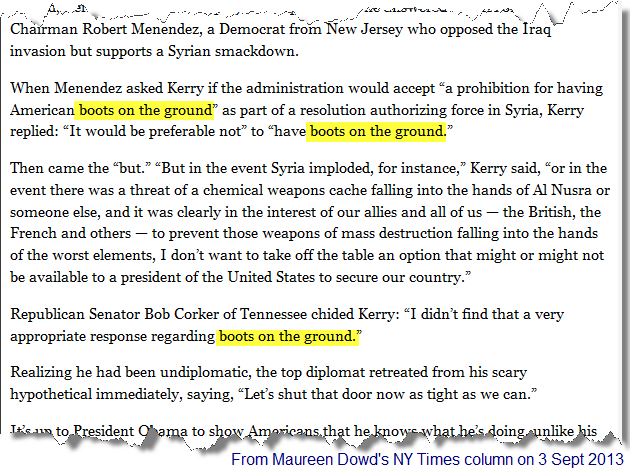 The attached clipping in which John Kerry, Bob Menendez, and Bob Corker all employ the overused military jargon is from Maureen Dowd's column in The New York Times yesterday, but it could just as easily have come from any other story about Syria, or the mouth of any "expert" I've heard on NPR or the PBS NewsHour in the past decade discussing our current or future quagmires. The lazy use of this metaphor for ground forces -- for actual young humans placed in harm's way by politicians -- seems to flow most freely out of the mouths of old men in dark suits trying to look manly in front of old men in brass-encrusted uniforms, but can we please stop it?